What are Ultrasonic Phased Arrays? The above figure displays the concept of phased arrays. Time delays to the eight elements control focusing and beam sweep. Focal spot size (shown by the shaded orange area) is controlled by beam spread. An important parameter of phased array is focusing. Focusing determines sharpness or flaw definition. Poor focusing results in large images that cab many times the size of actual reflector size. 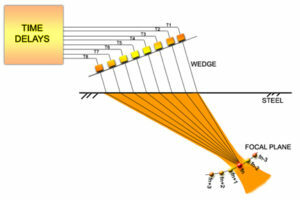 The focal spot size depends on the wavelength and active probe aperture (D). The spot size becomes sharper with reduced focal length (F), increased probe aperture and increased frequency. Focal limit is based on the wavelength and overall aperture of the probe. Same formulas apply as that of classical UT probes. No focusing is possible beyond the near field. The near field of a 5 MHz, 12 mm aperture probe using shear waves in steel is 60 mm. A hole in a calibration block will show as an arc on the PAUT image and not as a hole (see the picture below). This is because of the beam spread. Even if the beam is focused at the hole location, the beam finite focal spot size controls the size measured by phased arrays. Q1. Which probe has a sharper focus: 16 mm aperture or a 12 mm aperture (both probes have same frequency and number of elements). A1. Focusing depends directly on the aperture. So the 16 mm has a sharper focus than the 12 mm probe. Q2. Which 5 MHz Probe has a sharper focus: (a)16 mm aperture-16 element or (b) 12 mm aperture -32 element. Q3. If the 16 mm aperture-16 element probe has a sharper focus than the 12 mm aperture -32 element, then is there any advantage of using a more elements. A3. The larger elements transforms to smaller element size. Smaller the element size greater is the beam sweep. However, once the desired beam sweep is achieved there is minimal advantage of increasing the elements. A 5 MHz, 1mm element size will give an approximate sweep of 70 degrees for S-wave in steel and 140 degrees for L-waves in steel (based on 20 dB drop points). Q4. Is it possible to focus past the near field ? Q5. The software of my equipment allows me to enter a focal length that is greater than the near field. Is that valid ? A5. This entry will be meaningless. Q6. Can the inspection be done past the focal length ? A6. Yes inspection can be done; however there will be loss of resolution past the focal length.